Moong dal sambar is a healthy and delicious curry that gets cooked in less than 15 minutes. 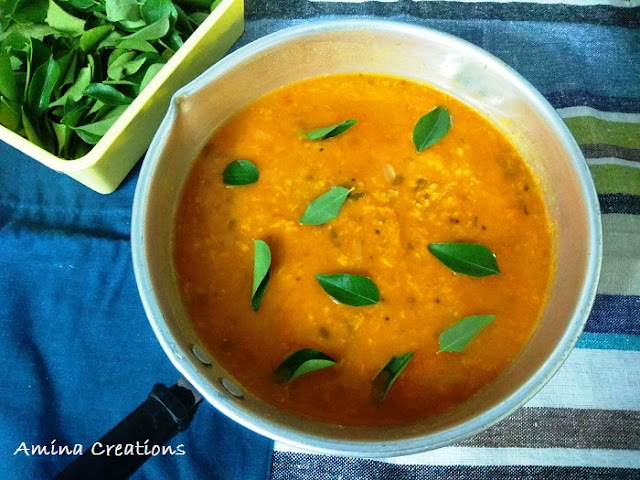 Moong dal sambar can be served with idlis, dosa, chapathi, upma, etc. This is a nutritious sambar that you can cook when you are short of time or wish to cook something fast. This is also an ideal dish for kids as it is not very spicy. For more curry recipes, check out this page. Drain water from the Moong dal and add the dal along with tomatoes, garlic, chilli powder, turmeric powder and 2 cups water to a pressure cooker. Mix well, close the lid and pressure cook for 4 whistles. Meanwhile heat oil in a pan, add mustard seeds, curry leaves, cumin seeds, dry red chilli, asafoetida, onions and salt and sauté till onions turn golden in colour. Then open the lid of the pressure cooker, coarsely mash the dal and add it to the pan. Mix well, check for salt, add ½ cup water and bring to a boil. Switch off the gas and serve hot with rice, dosa, idly or roti. Here I have dry roasted the moong dal in a pan for a few minutes till they turned slight golden in colour. Dry roasting moong dal adds a nice flavour and taste to the moong dal sambar.